Today we’d like to introduce you to Michael Plaza. 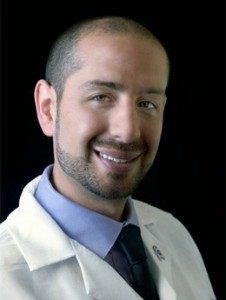 I first became interested in breast imaging during my first rotation with the breast radiology department in residency at the University of Miami and then really honed my skills during my fellowship at Memorial Sloan-Kettering Cancer Center. 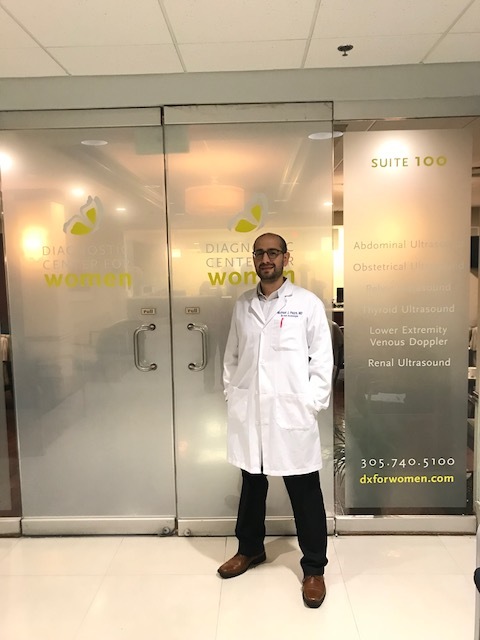 I was attracted to breast imaging because it is a unique area of radiology that allows for a very diverse workday including time reading screening studies, diagnostic imaging where we sometimes have to examine or scan the patient ourselves, and time doing procedures. Patient contact has always been important to me and the breast imaging specialty affords me the opportunity to work directly with patients by diagnosing breast lumps and now treating some breast cancers nonsurgically with cryoablation. 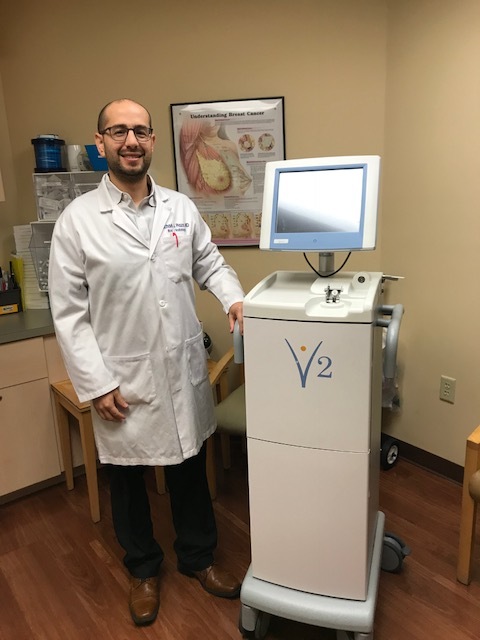 Before I tell you how I first started doing cryo let me first explain what cryoablation is… Cryoablation, or using ultra-freezing temperatures to kill cancer cells, for the treatment of breast cancers is new and innovative, and an area of current ongoing research. Cryoablation allows us to treat breast cancer nonsurgically through a tiny skin incision using only local anesthesia in under 30 minutes. The patient leaves the office with only a band-aid and can return to work the next day, and there is essentially no scar. I use ultrasound to guide me as a place a needle through cancer. Nitrogen is pumped to the tip of the needle forming an iceball around the tumor and essentially destroys it. It is the future of how we will treat small early breast cancers. The way I started doing cryoablation is almost accidental. I one day received an email about breast cryoablation from the company that makes the cryoablation device. I was interested because as radiologists we have always guided the treatment of breast cancer by finding the tumors and biopsying them, but with cryoablation, we can now directly treat the cancers we find. I started performing cryoablation on benign breast tumors in Feb. 2016 and in October 2016 I was the first doctor in Miami to successfully treat breast cancer with cryoablation. The difficulty of growing the breast cryoablation program at my facility, Diagnostic Center for Women, is that it is so new that most people are not aware of this option. 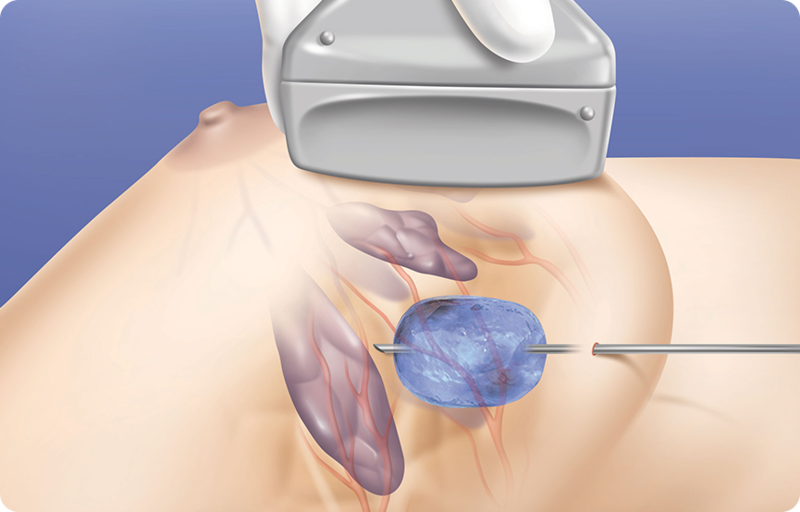 If a patient has a benign breast tumor that needs removal they automatically think surgery and are unaware of the freezing option that is just as safe and effective. We are also participating in a national multicenter trial called FROST (Freezing instead of Resection Of Small breast Tumors) that is looking to prove that treating certain small breast cancers with cryoablation is a safe and effective alternative to surgery. Although, a lot of patients qualify to participate in the trial most choose not to out of fear since it is unknown and something they have never heard of before. This has made recruitment for the trial difficult despite there already being data showing cryoablation is 100% effective in tumors under 1cm in size. I hope that through word of mouth, social media, and news coverage about the FROST trial and breast cryoablation in general that patients will become better educated about all their options for treating their breast tumor. I feel optimistic that the word is getting out as we have patients from all over the country fly into our center to treat their breast cancer with cryoablation. Please tell us about Diagnostic Center for Women. I have worked with Diagnostic Center for Women since 2014. It is a center that specializes in imaging for women. Half the center for obstetrical and gynecologic imaging and the other half does breast imaging. I am specialized in breast and body imaging. To put it simply my main job is to finding breast cancer early while it is small and has not spread. Most of my work is reading mammograms, ultrasound and breast MRI, as well as doing breast biopsies and cryoablation. I also read somebody ultrasound studies and female pelvic MRI studies working closely with reproductive specialists that treat infertility. I am the Director of MRI and have spearheaded the cryoablation program and research programs at our facility. The two major national multicenter trials that we are currently participating in are the FROST trial and ECOG-ACRIN 1141 trial. EA1141 is studying the use of screening fast breast MRI in women with dense breasts. The thing that I am most proud of is how well everyone at Diagnostic Center for Women works together. From the front desk to billing, to the techs and doctors, file room, and administrative staff we all work together as one unit making the center extremely efficient and effective. Despite seeing tens of thousands of patients a year we are still able to make each individual patient feel like they are a VIP. If I had to start over I would have gotten involved in doing breast cryoablation straight out of fellowship in 2014. I would have treated more patients and have provided this service to the Miami community a lot earlier.